Easy Narrative Writing lays the foundation that young students need to master upper level writing. 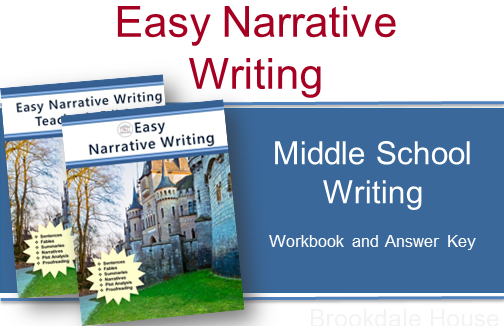 Easy Narrative Writing is an upper middle school writing series, designed to teach students to write with skill and structure. Students using Easy Narrative Writing develop foundational writing skills as they transition from learning sentence structure to learning narrative writing. Writing Complex Sentences with Subordinating Conjunctions. Writing Complex Sentences with Relative Pronouns. Writing Complex Sentences with Verbals. Amplifying Sentences with Strong Verbs. Paraphrasing: An Exercise in Choosing the Right Word. In Writing from Rhetoric, we spend a lot of time covering sentences because sentences are the basic unit of thought, and children must be able to manipulate sentences effectively to communicate their ideas. Variations of these 14 exercises are still present in many modern writing programs. They have remained popular because they begin at a level that is easily accessible to students—writing about fables—and progress gradually to persuasive arguments—defending or attacking a law. In designing this workbook, the progymnasmata exercises were used as a vehicle to introduce timeless writing skills to modern students. The primary focus of this workbook is on composing complex sentences, writing with varied sentence openers, rewriting fables, writing dialogue, expanding and condensing narratives, writing slanted narratives, and more. Easy Narrative Writing may be used as a one year textbook for younger students or a one semester textbook for more experienced writers.